An epic game. No, make that an instant classic. Words that get tossed around way too much to have much meaning. Words that don’t really describe Game 5 of the World Series, no matter how entertaining much of it was. And entertaining it was. 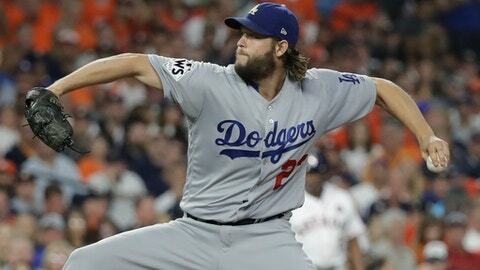 By the time Alex Bregman and Kenley Jansen combined to finally bring it to a close at 12:38 a.m. local time Monday in Houston there had been so many plot turns for the Astros and Dodgers that it was hard for fans around the country to sort them all out before finally heading off to bed. Great drama, yes. So much so that the game scored a rare TV ratings win over the NFL Sunday night game between Pittsburgh and Detroit. Great fun, too. At least the people dancing between innings in the expensive seats behind home plate at Minute Maid Park seemed to think so – and that was before the Astros finally ended things 13-12 in the bottom of the tenth inning. But was it great baseball? Not even close. The best pitcher in baseball blew a four-run lead, then blew another three-run lead for good measure. The former Cy Young winner who started for the Astros didn’t even make it out of the fourth inning. The best closer in the game had a late meltdown for the second time in this series. And the closer on the Astros never saw the mound after being shellacked the night before. It wasn’t like they weren’t given a chance to succeed. Umpire Bill Miller’s strike zone was as wide as the train that kept chugging atop the left field wall at Minute Maid every time the Astros scored. But in a bandbox of a ballpark, balls flew everywhere. Seven of them cleared the fences, five of them hit by the home team. You can’t just blame modern architecture. In Game 2 at Dodger Stadium, the teams combined for a record eight home runs, and already the series record for home runs has been shattered – with potentially two games remaining. It’s enough to get the tongues of the conspiracy theorists wagging. Interestingly enough, one of them will be starting Game 6 Tuesday night for the Astros. Justin Verlander thinks the balls for this series are slicker, making sliders tougher to throw. He’s not, because as little as two years ago Rob Manfred was searching for ways to get more offense in the game. No one, it seems in this day of nonstop action, wants a 2-1 game anymore. Keep this up, though, and Manfred may start looking into raising the pitcher’s mound again. Yes, the game of baseball has changed. That was evident early in Game 2 when Dodgers manager Dave Roberts lifted starter Rich Hill after four solid innings in which he struck out seven and allowed just one run. It was evident later in that game when the Dodgers were on their ninth pitcher of the night, and balls kept flying out of a stadium where home runs were just an abstract concept when it was built in the early 1960s. And then came Sunday night/Monday morning and a game where 14 pitchers were all pretty much equally lousy at getting hitters out. Some of that can be blamed on the grind of the season and the length of the playoffs. Arms are tired, and pitchers aren’t always used properly or in their natural rotation. And every batter who comes to the plate these days seems to take giant uppercuts with the bat that the people in analytics say will pay off with more home runs. Pitchers are left to throw the ball that baseball officials insist hasn’t been juiced and, if they’re not too shell-shocked, to add it up when it’s all over. Entertaining, yes, but so was Game 1 when Clayton Kershaw pitched an immaculate seven innings in a game that took less than half the time of the 5-hour, 17-minute marathon that was Game 5. That was the fastest game in 25 years in the World Series, but it quickly became clear it was an aberration in this series. Kershaw is going to have a tough time dealing with his latest outing, which adds to his postseason woes. But he’s not alone in a series that is destroying a lot of pitchers’ reputations. For baseball, it’s all good if it draws eyeballs. And the ratings Sunday night seems to show the big bats are doing just that. Keep this up, though, and we’ll all be worn out before this epic World Series finally ends.